MS Calculator displaying the cheer up feature. The MS Calculator's new function. Microsoft Calculator (shortened to MS Calculator) is a program that comes with all Windows PCs. It is used to calculate the amount of time a person has left to live. 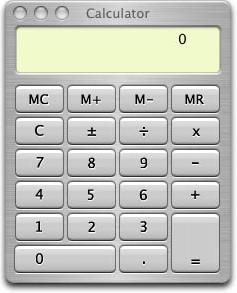 MS Calculator displaying a finished transaction of 100 added life minutes. MS Calculator was first thought of when a man (who's name we cannot release) wanted to know when he was going to die. He thought up the idea to make a "Calculator" that could calculate the precise second you would die. One day Microsoft found out about this idea and of course they did what they always do when they hear about something that could make them money... they stole it. Now the man who originally thought of the idea never intended on making a digital calculator, but a real, solid calculator. So Microsoft made their digital calculator and then later on when the man tried to sue them for stealing his idea, they claimed that their calculator was completely digital and his real. Microsoft's case held up in court and they got away with it. The MS Calculator had a wide variety of features, such as telling you how long you have to live, telling you how long before you die, saying things to cheer you up (after telling you're going to die), and telling you the date and time. You can add time to your life using MS Calculator, it costs $1 for 1 minute of extra life. This feature is used mainly by stupid wealthy people, who spend millions of dollars adding life to them thinking they will live forever. The new fresh design of Calculator will be included in the next version of Windows. The amount of Microsoft PCs that were sold because of MS Calculator is approximately 18,000,000 in the course of 1 year. Microsoft was raking in piles of cash by the million at one point they were literally giving away money. They later used all of this money made from MS Calculator to create the Microsoft Xbox. After getting sued by the families of MS Calculator customers, multiple times, Microsoft decided to cut their losses and make some changes to MS Calculator. The new MS Calculator was programmed to calculate mathematical problems for you.